I have to admit I was hooked on Savannah from the moment I first watched Midnight in the Garden of Good and Evil. I remember thinking that I just had to visit this place that was home to that colorful cast of characters. Sadly many years passed before I could actually realize that dream; but once I did, I just fell in love with the city. I was also pleasantly surprised, as I was expecting to find mediocre access at best; after all Savannah is a very historic city. I arrived to find quite the contrary. In fact, I soon discovered that not only does Savannah just ooze with Southern charm; but it’s also a great destination for wheelchair-users and slow walkers. The best place to start your Savannah visit is at the Visitors Center (912-944-0455, www.chsgeorgia.org/Tricentennial-Park-Sites.html), located in the old Central of Georgia Railway Passenger Station. There’s plenty of accessible parking in the adjacent lot, with lift access up to the Visitors Center. Inside you’ll find lots of information about local attractions, a nice collection of maps and brochures, and a virtual army of helpful volunteers. And don’t miss the Savannah History Museum (912-238-1779, www.chsgeorgia.org/Tricentennial-Park-Sites.html), located next door. It’s a great way to learn about Savannah’s history, as it includes everything from Johnny Mercer memorabilia and the Forest Gump bench to an old Model A. There’s also a nice kid’s area where little ones can play dress-up and learn a little bit about Savannah of yesteryear. There’s level access to the museum, with good pathway access to the exhibits. And although a few of the exhibits are located on raised platforms, lift access is available. From there, it’s just a short walk over to the Whistle Stop Café (www.chsgeorgia.org/Tricentennial-Park-Sites.html), which makes a great lunch stop. There is ramp access up to an old diner car which has been converted to a restaurant. It’s a bit tight for a wheelchair as there’s a corner with 18-21 inches of clearance, but it’s very doable for slow walkers who can’t manage the 3-4 steps up to the rail car. There are also tables surrounding the rail car, if you are unable to access it. No matter where you sit, you won’t be disappointed with the fare, as they serve up a hearty lunch special that consists of a meat and two sides. You won’t go away hungry. And don’t forget to take a gander at Battlefield Park after lunch. Located just across the street, this site serves as a memorial to the more than 800 men who died in the Revolutionary War’s Siege of Savannah on October 9, 1779. There is ramp access to the crosswalk from the back door of the Whistle Stop Café, and although there is level access to the park, the driveway can be a bit problematic as it’s covered with gravel. Best bet is to roll on the grass for a smoother ride. The Georgia State Railroad Museum (912-651-6823, www.chsgeorgia.org/Tricentennial-Park-Sites.html) is located next door to Battlefield Park; and although it has a few access obstacles, it’s a must-see for died-in-the-wool train buffs. 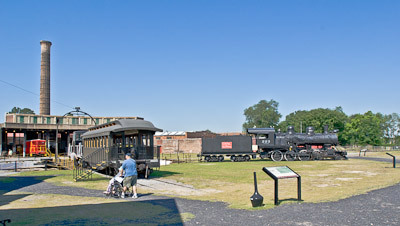 This open-air museum includes a 1855 roundhouse that houses an impressive collection of vintage rail cars. A guided tour of the site is available, but it’s not accessible as it goes inside the Atlanta Car, which isn’t ramped. Still, the tour is included with admission, so it’s worth doing the accessiblr part of the tour through the roundhouse. On the plus side, there is ramp access to the carpenter’s shop and up to the Norfolk & Western Railway boxcar. The pathways are difficult in some places because of the gravel ground cover, but you can still get a decent look at most of the rail cars. A ride on a vintage rail car with a trip through the turntable is also included with admission; however you have to be able to climb 3-4 steps to do it. It’s not the most accessible attraction in Savannah; however true train buffs will probably want to give it a shot. The good news is, you don’t even have to move your car to see the rest of historic Savannah; in fact you can park all day at the Visitors Center and take the free DOT Express Shuttle (912-447-4026, www.connectonthedot.com) around the historic district. This lift-equipped shuttle stops in front of the Visitors Center on Martin Luther King Boulevard, as well as 11 other attractions in the historic district. Buses come about every 20 minutes and you can get on and off whenever you like. Alternatively, you can just stay on the bus for the entire loop for a nice little tour of the historic area. And when you’re sightseeing, just look for the bus stops with the big purple dot. It’s the easiest and most accessible way to see the city. 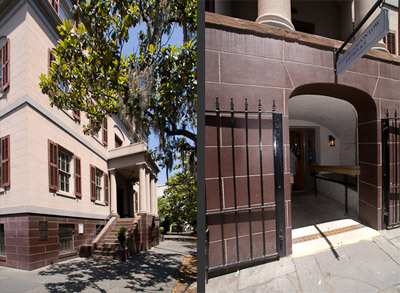 If you like historic home tours, then make sure and save time for a visit to the Juliet Gordon Low Birthplace (912-233-4501, www.juliettegordonlowbirthplace.org), as it’s the only historic home in Savannah with an elevator. It’s also a big draw for Girl Scouts and former Girl Scouts as Low is the founder of the Girl Scouts of the USA. There’s ramp access to the gift shop and the admission desk, with excellent access on the guided tour. This English Regency House was built in 1821 for James Moore Wayne, Savannah’s mayor; and later became the family home of Juliet Gordon Low. The home contains most of the original furnishings, and the tour focuses on Juliet and her life in Savannah. Known as Daisy, she was particularly creative and she wrote poems, sketched, acted in plays and later became a skilled painter and sculptor. She was also very personable and even entertained General Sherman with tea on his march through the South. Of course, Low’s crowning achievement came on March 12, 1912 when she gathered together 18 girls to register the first two patrols of the American Girl Guides. The name of the organization was changed to the Girl Scouts the USA the following year, and the rest is history. 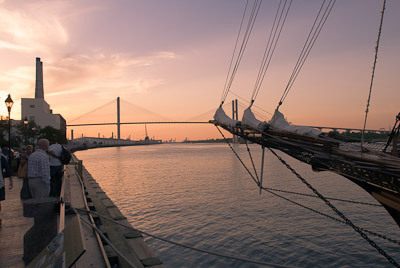 All in all it’s a fascinating tour, as it also covers a good part of the history of Savannah. Be forewarned though, you’ll probably find the house filled with Girl Scouts, as it a very popular field trip for troops. 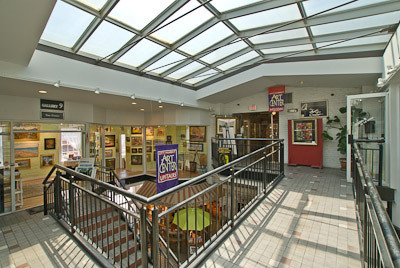 If you’d like to explore the local art scene, be sure and stop at the Art Center of City Market (912-232-4903, www.savannahcitymarket.com). Patterned after the Torpedo Factory project in Alexandria, Virginia, this gallery and studio space occupies 19,000 square feet. There’s level access to the building, with elevator access to the second floor. 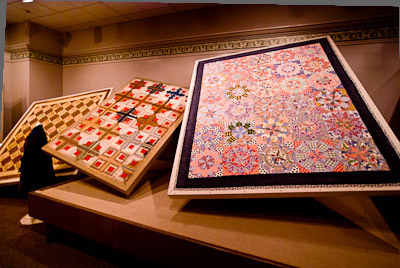 Stop in and see the artists at work, and take home a piece for your own collection. 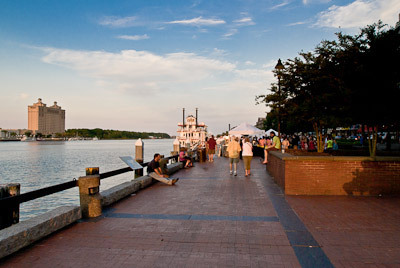 No visit to Savannah is complete without a stroll along the historic riverfront. There’s elevator access down to the river behind City Hall, on the Corner of Bay and Bull Streets. Alternatively, the DOT Express Shuttle also stops down there. The riverfront features level access and it’s just fun to stroll along or stop in at one of the many great seafood restaurants. Try and hit the area on the first Saturday of the month, as First Saturday on the River runs all day and attracts a nice colection of arts and craft vendors. 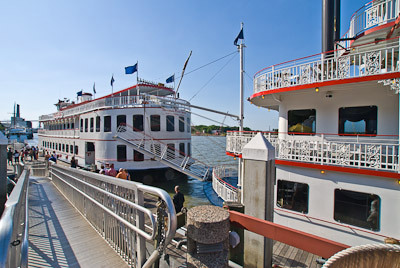 And for a fun cruise on the Savannah River, hop on the Savannah River Queen at City Hall Landing. There’s ramped access to the boat, and plenty of room for wheelchairs aboard. The ferry stops at the Westin dock and the Waving Girl Statue before it returns to City Hall Landing. Best of all, there’s no charge for the ferry, which is operated by the same folks who run the DOT Express Shuttle.